for more information and to access the data. If you have familiarity with the region, please help these efforts by contributing data about Chile on Google Map Maker. We will be refreshing the download data frequently to reflect the latest set of contributions. View Chile Earthquake helpful information in a larger map. This map will continue to be updated with additional information. We will be updating imagery, maps, and other information as they become available and will continue to post updates to this blog. An overview of resources available, latest news, and links to make a donation can be found on Google's Chile earthquake relief page at http://www.google.com/relief/chileearthquake/. After hearing of the devastatingly powerful 8.8 magnitude earthquake that struck Chile overnight, we began to mobilize several teams to see what Google resources could help with disaster response. Google Map Maker is currently available in Chile, and we are making this map data available for download by relief and aid organizations. Visit http://mapmaker.google.com/datadownload for more information and to access the data. If you have familiarity with the region, please help these efforts by contributing data about Chile on Google Map Maker. We will be refreshing the download data frequently to reflect the latest set of contributions. 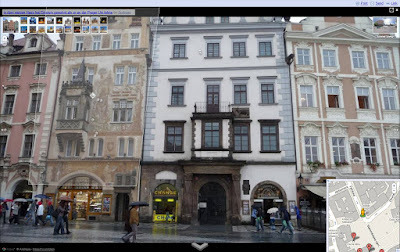 to the 3D Buildings layer in Google Earth. No trip to virtual Athens would be complete without a visit to the Parthenon. The architecture of the Parthenon is fascinating; all of its lines exhibit subtle curvature (the columns, for example, are slightly convex) in order to avoid the optical illusion of concavity resulting from parallel lines viewed at a distance. While you're on the Acropolis, duck over to the Herodeion Theater, where for almost two thousand years music and theater performances have been held -- check out its schedule during the Athens Festival. No knowledge is ever wasted. In college I took three semesters of Greek civilization because I thought it was nifty (and apparently I also had some plan involving never graduating, but that eventually fell through). Although this makes me more fun at parties than I'd otherwise be, I have had no practical use for the information. Until now! We're pleased to announce the addition of Athens, Greece to the 3D Buildings layer in Google Earth. No trip to virtual Athens would be complete without a visit to the Parthenon. The architecture of the Parthenon is fascinating; all of its lines exhibit subtle curvature (the columns, for example, are slightly convex) in order to avoid the optical illusion of concavity resulting from parallel lines viewed at a distance. While you're on the Acropolis, duck over to the Herodeion Theater, where for almost two thousand years music and theater performances have been held -- check out its schedule during the Athens Festival. or even perched on a snowmobile can capture). 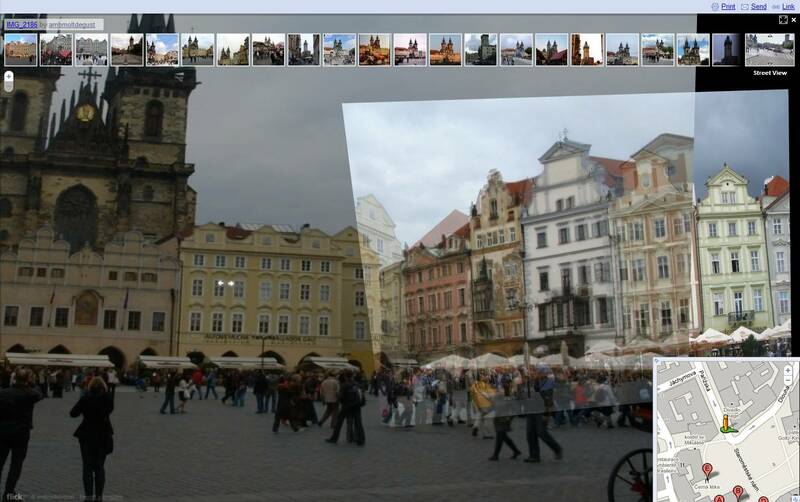 That's one reason why we began integrating user photos into Street View last year. User photos allow you to view locations from entirely new perspectives, whether through the eyes of a talented photographer with a knack for capturing architectural detail, or simply taken from locations we couldn't get to. Today, we're making it easier to navigate through these images in a way that should feel similar to how you're used to exploring within Street View. Our personal suggestion is that you start at the Sagrada Familia in Barcelona. We hope you enjoy this new way to explore through the impressive array of user photos in Street View! 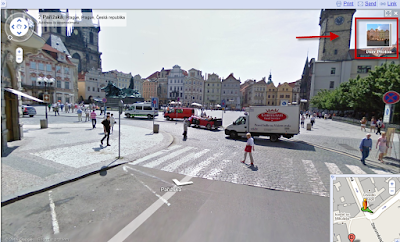 With Street View in Google Maps, you can explore millions of images taken in places across the world. But the photographs you see are based on what the cameras on top of our cars, driving on public roads, can capture (or, in a few cases, what the cameras on our trike or even perched on a snowmobile can capture). 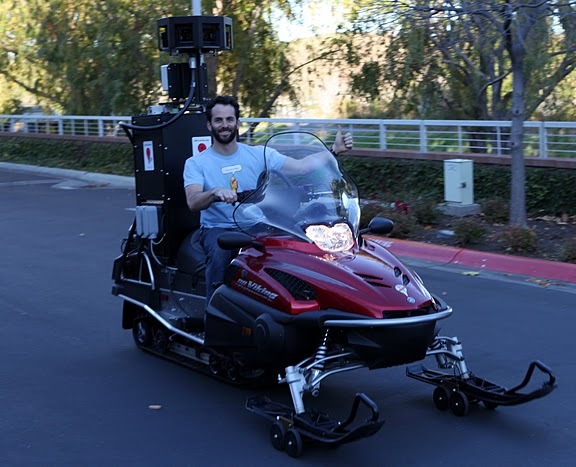 That's one reason why we began integrating user photos into Street View last year. User photos allow you to view locations from entirely new perspectives, whether through the eyes of a talented photographer with a knack for capturing architectural detail, or simply taken from locations we couldn't get to. Today, we're making it easier to navigate through these images in a way that should feel similar to how you're used to exploring within Street View. and Google Building Maker to open a balloon. 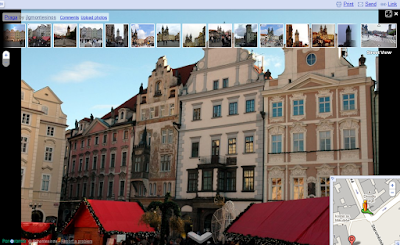 Today, we've added two new sections to those balloons: Photos of nearby places and Nearby places. Not only can you learn more about the place from the balloon, but you can also dig deeper by following the links. Want to see more nearby photos and places? 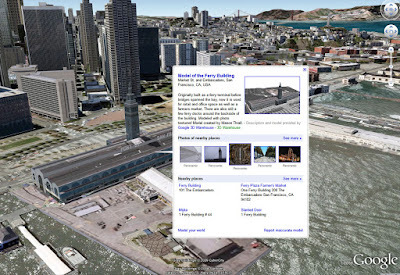 What to learn about the Ferry Building listed as a nearby place? Click the links in the balloon to explore further. Next time you're exploring a city with 3D buildings, watch for the familiar glow as you hover over a building, and give it a click. You might learn something new about the place. 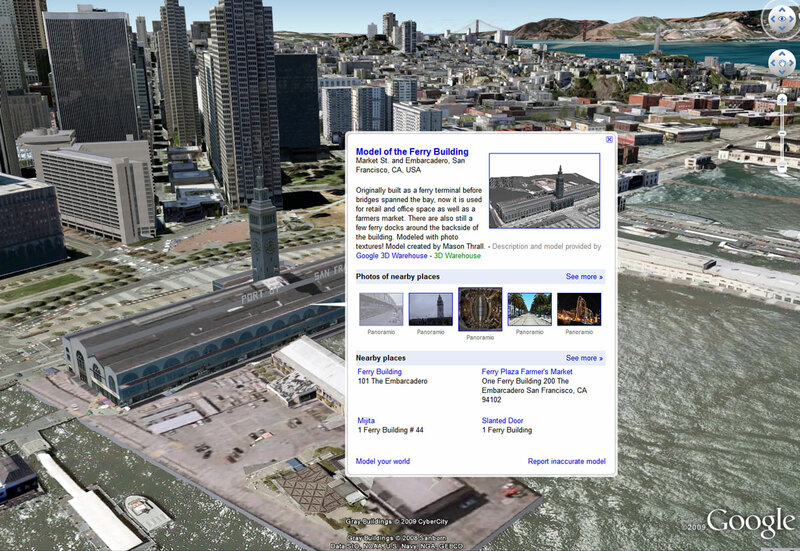 The 3D buildings in Google Earth are a great way to understand an area visually, and they just got better at conveying information about the place itself. Currently, you can click on model that was created by 3D modelers using tools like Google SketchUp and Google Building Maker to open a balloon. is a place in the cloud for your data tables. Today we're announcing some new features that will let you upload and map large amounts of geographic data. This used to require a developer, but now you can do it yourself. You can also now hide and show different data depending on your own criteria. Here's a great example. Tom and Dirk at MTBGuru.com have a database of bike trails their users have submitted from around the world. Each bike trail includes hundreds or thousands of geographic points. In a blog post today, MTBGuru.com describes their experiences using Google Fusion Tables to show all 5000 trails on one map, embedded directly on the site. Zoom into an area and the actual paths of the trails become visible. 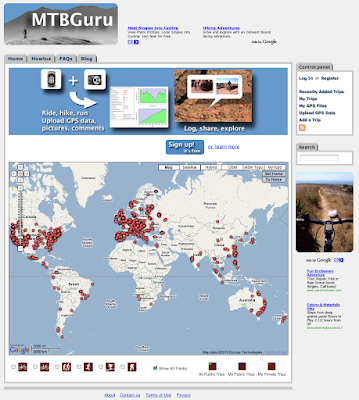 Play around with the interactive map below, which shows data from MTBGuru. 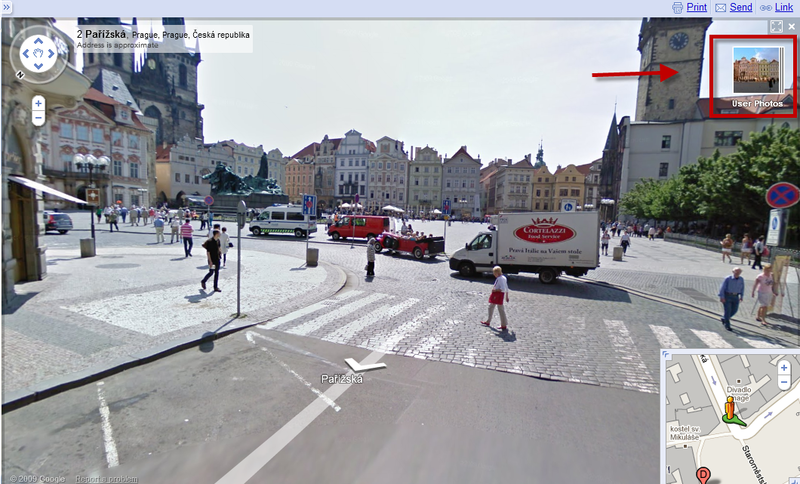 For starters, we're zoomed in to Prague, and not only can you see the trails, but each line is clickable. Too many trails? Want to find trails long enough for a heart-pounding workout? Filter for trails longer than 70 kilometers and show just those on the map. It renders in seconds. To try this for yourself, go to Tom and Dirk's live map. You can also read the MTBGuru.com blog to hear from . In addition to filtering, aggregating, mapping points, lines, or polygons, and exporting to Google Earth, with Google Fusion Tables you can integrate different data sources, collaborate with others on columns, rows, and cells, and visualize your data in lots of other ways. If you want to connect your database to the Fusion Table map programatically like MTBGuru.com did, check out our API. We hope you enjoy your newfound freedom to map and filter large data sets, and we'll continue to let you know about more cool new mapping features in Google Fusion Tables as they become available. Got a database full of cool data you want to show on a map? It just got easier. Google Fusion Tables is a place in the cloud for your data tables. Today we're announcing some new features that will let you upload and map large amounts of geographic data. This used to require a developer, but now you can do it yourself. You can also now hide and show different data depending on your own criteria. into Panoramio. By uploading your best photos of places into Panoramio you can share them with the Panoramio community and the world through Google Earth, Google Maps, Google Search, and more. You'll need to log-in or create a Panoramio account to upload photos. last month, we knew Nexus One was going to be a great platform to showcase the rich (and technically demanding!) 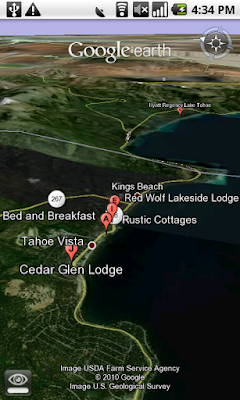 features of Google Earth. With a 1GHz processor, advanced 3D graphics, and Android 2.1, Nexus One packs a lot of performance in a thin package. Ever since we got our hands on one, we have been putting it through its paces, drawing complex scenes of 3D imagery, terrain, roads, and other layers, and Nexus One never misses a beat. Now that we have put the final touches on the app, we are happy to announce that the latest member of our family is ready for the world -- Google Earth for Android. 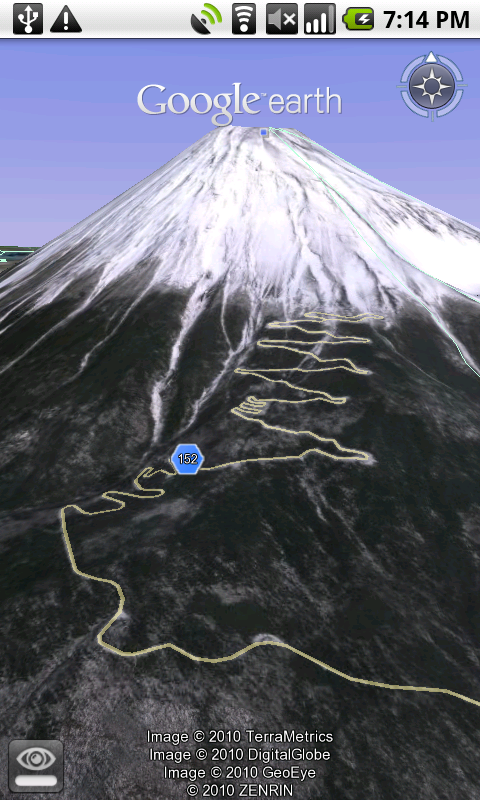 This is our fastest mobile version of Google Earth yet, with a smooth framerate and a beautiful 800 x 480 screen. , and those located in San Jose and Houston will see an invitation to enhance their listing for a flat fee of $25/month in the dashboard. Interested businesses outside these areas can be notified when enhanced listings come to their area by filling out this form. We recently launched a trial, currently limited to the cities of San Jose and Houston, for a new ads feature in local search that allows business owners to enhance their listings. We've seen a lot of curiosity about this feature, so I wanted to take this opportunity to provide further information about it for everyone interested in learning more. These enhanced listings allow business owners to highlight an aspect of their Local Business Center listing that they think best reflects what they have to offer their customers. The business owner can choose to enhance the way their listing appears in search results by including a link to point customers directly to photos, videos, website, coupons, directions, menu or reservations signup. Let's say a deli owner thinks the huge selection of imported cheeses really makes her deli stand out - she may want to give potential customers a quick way to see the menu on her website or a photo of her display case. Customers who access this relevant information can make an easier, more informed decision about which business to call or visit. These enhancements are an easy and straightforward way for businesses to emphasize information that may already be available on their Place Pages or websites, and to connect with interested, locally-based potential customers. 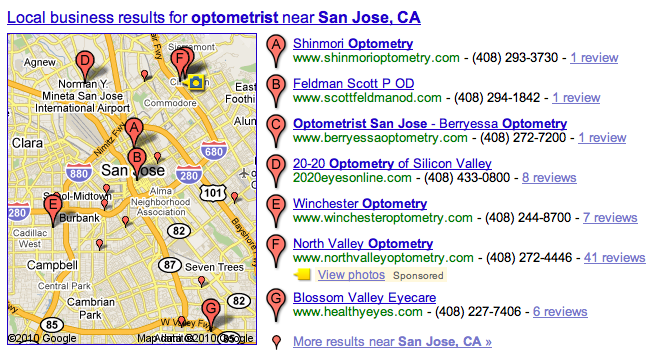 When the listing shows up in your Google.com or Google Maps search results, the enhancement also appears alongside it. The enhancements do not affect the ranking of LBC listings, and we clearly indicate which parts of the search result are sponsored. We hope both users and business owners find this feature useful, so we'll monitor the trial closely and may make changes. Based on the initial results, we may choose to expand it into additional areas. We don't have a specific timeline to share at the moment but we'll post again if and when we do. In the meantime, business owners can claim their listing in the Local Business Center, and those located in San Jose and Houston will see an invitation to enhance their listing for a flat fee of $25/month in the dashboard. Interested businesses outside these areas can be notified when enhanced listings come to their area by filling out this form. 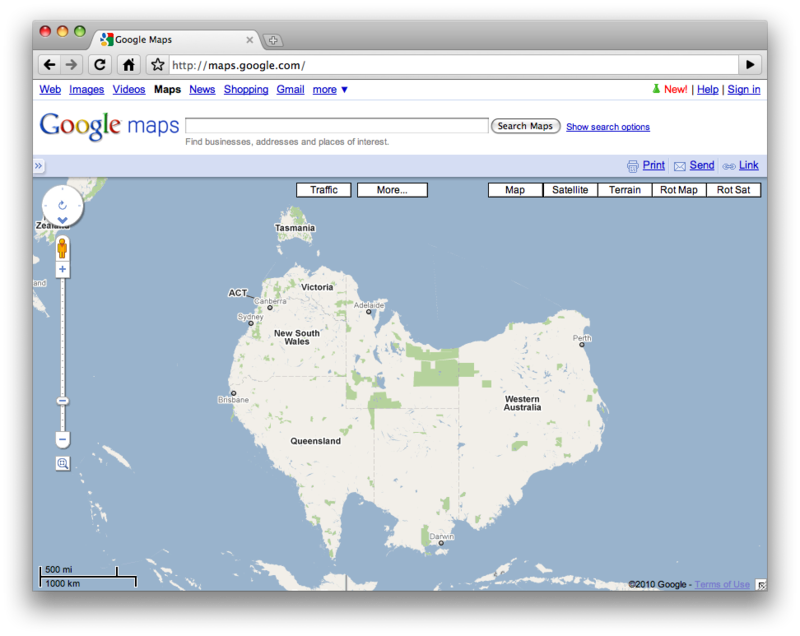 p Maker maps display in Google Maps for more than 140 countries and territories, including the Philippines. As of late last year, Wayne's mapping contributions in the Philippines are also available as part of the Map Maker download program. Non-profits, government agencies and individuals can use the mapping data in the Philippines and more than 60 other countries for research, humanitarian relief and other non-commercial uses. For his remarkable mapping efforts, Wayne has won a $50,000 UNICEF donation to benefit projects empowering young people through technology in the Philippines. 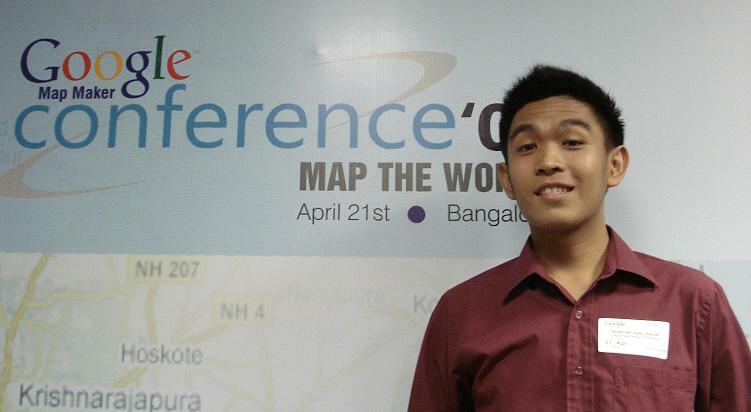 Wayne will get a VIP tour of the local projects in the Philippines that are benefiting from the $50,000 donation, and he will also attend the upcoming Supper Mapper 2010 conference at Google's office in Zurich, Switzerland. Congratulations to Wayne for winning the grand prize -- the $50,000 donation to UNICEF will go to projects in the Philippines! 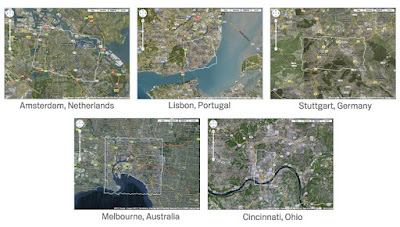 Google's first Global Mapping Competition ran from December 15 - January 31, 2010 and the big moment has come: announcing the winner! The competition entrant who added the most universities, schools, hospitals, and medical clinics with high quality into Google Map Maker was (drumroll please...) Wayne Dell Manuel of the Philippines. Already one of the top 10 all-time mappers, Wayne made hundreds of moderations and added more than 1500 qualifying map features (i.e. schools, universities, hospitals and medical clinics) during the course of the competition. Google Map Maker is available in more than 175 countries and allows users to become "citizen cartographers" by adding and editing map features. Wayne Dell Manuel at the 2009 Map Maker user conference in Bangalore, India. during times of calamity such as typhoons and earthquakes which are common to the Philippines. It would greatly help in disaster planning and management." Wayne's dedication to mapping his homeland is motivated by helping others: "After the devastating typhoon Ketsana (local name Ondoy), a volunteer group used Google Maps to map distress calls, among other things, to facilitate rescue operations. I was so happy to see the roads that I've helped map were used to locate the houses." 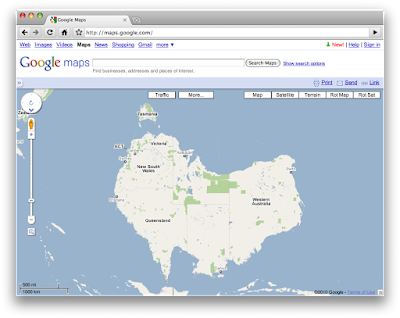 Map Maker maps display in Google Maps for more than 140 countries and territories, including the Philippines. button and test your world geography with our Where in the World game. Or in case you still yearn for the days when you could turn paper maps upside down we even have Rotatable Maps. We chose not to offer a lab that replicates the experience of struggling to fold a map back up though. If you really miss that, we can't help you. Because they're experimental, Labs may not be quite as robust as some other features on Google Maps. In fact there's a chance they could change, break, or disappear at any time. Just in case, we've provided an escape hatch. If you discover that a Labs feature causes you problems use this link to disable all Labs and select just those you want to keep: http://maps.google.com/maps?ftr=0. We hope Labs enhance your Google Maps experience and look forward to adding more in the future. To keep up to date with the latest Labs, get help with a particular Labs feature, or even suggest new Labs, check out the Maps Labs Google group. We are pleased to announce the launch of Maps Labs, a set of opt-in features that add useful functionality to Google Maps. 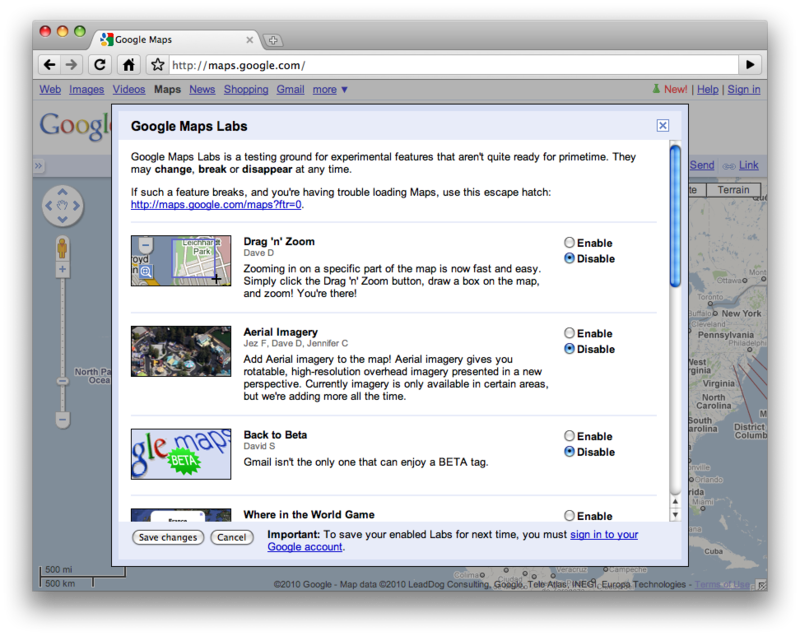 Labs allow us to quickly experiment with new Google Maps features, add new ways of interacting with the map, or just try out something wacky. If a Lab proves popular it may become a standard feature of Google Maps in future. To activate individual Labs features, click on the green conical flask icon at the top right of the screen. This will bring up a list of Labs that you can enable. If you're logged in with your Google account, we will remember which Labs you have enabled when you next visit Google Maps. To get started we have a range of useful Labs available today. 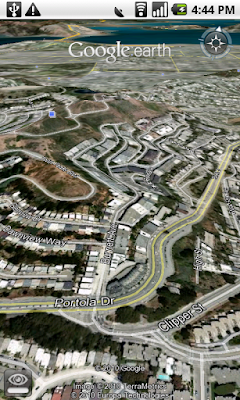 You can enable the Aerial imagery that we recently launched in the Google Maps API. You can zoom in to a particular location just by dragging a box around it using the new Drag 'n' Zoom control. You can browse nearby businesses with the What's Around Here button and test your world geography with our Where in the World game. Or in case you still yearn for the days when you could turn paper maps upside down we even have Rotatable Maps. Want to be a Favorite Place on Google? Enter information for your business listings and verify that you are the business owner or authorized business listing manager by 12am PST on March 1. This means that you need to enter the PIN number that you receive by mail or by phone call by this deadline. You should allow 5-10 business days for your pin to arrive by mail - so get going now! If you are given the option to verify your listing by phone, the PIN will be delivered to you by an automated phone call within seconds. (Be sure to be ready to write it down). If you're identified as a Favorite Place, expect your decal with custom QR code to arrive within a few weeks. We'll let everyone know when the mailings have started to go out. You can learn more about the selection process here. If you verified your listing between the middle of October 2009 and now, you can relax: your listing is already eligible to be recognized as a Favorite Place. Of course, registering with the Local Business Center won't guarantee you'll get one of the coveted stickers, but it is necessary for you to be considered! Retail chains are now eligible to participate - just make sure to request verification after you've uploaded your bulk feed. If you haven't requested verification for a feed that you've already provided, do it here. In case you're wondering how you could possibly become a Favorite Place on Google with only a couple weeks of having your listing verified: in most cases your business has already been listed on Google for some time through various other data sources, and we have data on how that listing has performed. But when you claim the listing for your own business, it's the best indication to us that your business information is correct. Businesses which verified their listing prior to October 2009 were already considered for the first wave of Favorite Places on Google, and won't be eligible for another decal at this time. However, if you were already recognized as a Favorite Place and your sticker has since been lost, damaged, or otherwise misplaced, you can request a replacement with this form. We've just finished pushing out an imagery update for Google Earth and Google Maps, check to see if any of your favorite places has gotten an update! You can view the updated areas highlighted in red below. Alternatively, you can download this KML, for viewing in Google Earth or you view the updates in Google Maps. Also included in this update is additional Haiti imagery from January 25th. Today marks the 31st anniversary of the Islamic Revolution in Iran, and with it a new round of demonstrations has presumably arisen. With tight controls of media and Internet access, it's very hard for those outside of Iran to get a clear picture of what's going on on the streets of Tehran and around the country. If you prefer to view this imagery on your desktop you can download the KML file. In addition to this view from above, hundreds of videos from on the ground are finding their way around government lockdowns on websites such as YouTube and providing witness to the world. For a selection of these views, visit CitizenTube, a blog about citizen journalism maintained by our colleagues at YouTube. We're excited to announce the appearance of a fourth continent in Google Building Maker: Australia. This doesn't mean you have to eat Vegemite, know what a boomerang is or sing a Men a Work song to get started -- just visit Building Maker and select the city where you wish to start modeling. The addition of these five locations brings the total number of Building Maker cities to 71. Today we announced Google Buzz, a new product that integrates with your Gmail inbox and makes it easy to start rich conversations about the things you find interesting. Google Buzz lets you share web links, photos, videos, and more with those who are important to you. Rather than simply creating a mobile version of Buzz, we decided to take advantage of the unique features of a mobile device - in particular, location. We go through many experiences when we're on the go, and while there are lots of ways to share these experiences with your friends or even the world, there isn't always an easy way to let your audience know where you are when you post. Your location brings valuable context to the information you share. For example, does "Delicious dinner!" mean you're at a great restaurant, or that you had a wonderful home-cooked meal? Your mobile phone, which is with you almost all the time, can help answer these questions. Google Buzz for mobile allows you to post buzz and keep up with your friends when you're away from your computer. It also uses your location to identify places around you. You can select one of these places and attach it as location tag to your posts, or read what others have posted about the place. * Buzz.google.com: This web app provides access to Buzz from your iPhone or Android phone's browser, allowing you to view and create buzz messages. It has two different views: 'Following' view shows buzz from the people you follow, just like Google Buzz in your Gmail; 'Nearby' view shows public buzz that has been tagged with a location near you, and might be from people you don't follow. From Nearby view, you can also select a specific place from the list of nearby places and view posts attached to that place. 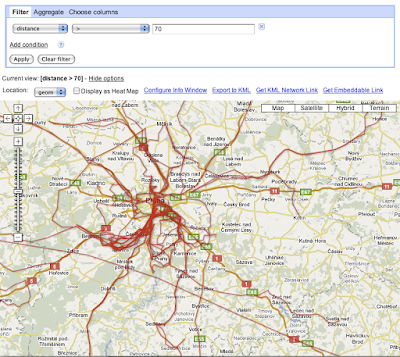 * Buzz on Google Maps for mobile: The new Buzz layer allows you to see buzz near you or anywhere on the map. You can post public buzz directly from the layer, and even attach a photo from your phone. Also, try visiting a mobile Place Page to read recent comments or to post buzz about that place. You can access Place Pages from the web app as well, by tapping on the place name in any location-tagged post. * Buzz Shortcut from Google.com: You will see the buzz icon in the top right corner of the google.com homepage. Just tap on the icon to trigger the posting box. * Voice Shortcut: The voice shortcut, which is available in the quick search widget on Android and in Google Mobile App on iPhone, allows you to post buzz without typing anything. Just say 'post buzz,' followed by whatever you'd like to post. 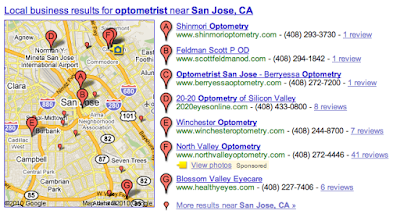 When adding location to buzz posts, we focused on places, not just a lat/long location or an address. We wanted to make location information more useful both to your followers and to help others discover information about nearby places. 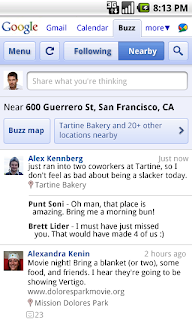 If you don't want to include your location when you post buzz, it's easy to exclude your location and post without it. You also control whether your buzz posts will be public or private - by default or for individual posts. While anyone can access your public posts, private posts are viewable only by the people you choose to share them with. With Buzz for mobile, we hope you can start interesting conversations about places and be more spontaneous when you are out and about. How many times have you missed a fun event, even though it was nearby? Or a better choice of dessert, just because you didn't know about it? How often have you wondered "Where are you?" when reading a text message from a friend? Now, you can use Buzz to learn that there is going to be a movie night at your favorite park, share with the world that there is an awesome ice cream place right around the corner, or tell your friends about that delicious homemade lasagna. To start using Buzz for mobile, go to buzz.google.com from your phone's browser. It is currently available for Android and iPhone, but we're working to bring it to other platforms. 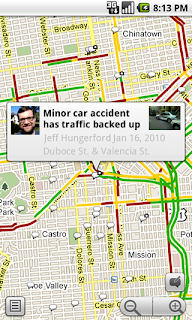 The Buzz layer on Google Maps for mobile is available on Android, Windows Mobile, Symbian, and iPhone (as web maps). Learn more in our Help Center. 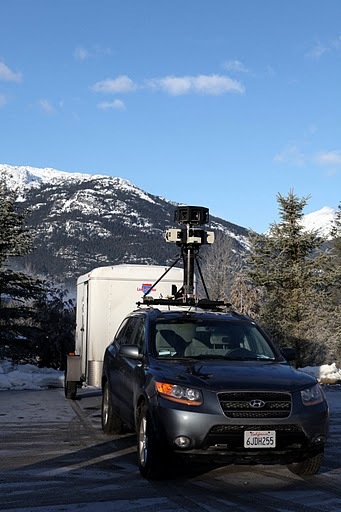 Elsewhere around the world, today we’ve also added Street View imagery of Norway and Finland - two countries that you’ll be seeing represented well on the slopes - and we’ve expanded our coverage all across Canada, this year's host country. To learn more about other ways to explore the games with Google, visit the Official Google Blog and our website at www.google.com/games10. right around the corner and that I might consider picking up some smoked fish at Russ & Daughters down the street. You'll notice that we do not limit these suggestions to places sharing any specific characteristic; instead, we use a broad set of signals to come up with what are hopefully the most interesting suggestions. We're still working on refining these signals, so bear with us if your serendipitous discovery of a new place is even more unexpected than you'd anticipated. So, the next time you want to try a new place to eat, need a replacement for an activity with long lines or closed for the day, are planning a vacation, or are just exploring a neighborhood, check out the "Nearby places you might like" - maybe something will catch your eye! When you live in New York City, everyone has an opinion on where to eat. And usually, telling someone a place you love will lead to a long conversation of a string of other places you should try. For example, one of the more interesting restaurants I've eaten at in NYC was recommended to me by someone who knew I loved a different restaurant by the same owner. And, when I told a friend I was heading to the Lower East Side to get some yummy knishes for lunch, he told me to make sure I checked out the famous Guss' Pickles right around the corner and that I might consider picking up some smoked fish at Russ & Daughters down the street. Imagery from 1935 and 1945 for Warsaw in Poland is particularly compelling. The city was amongst those most badly damaged in the war and comparisons with today are striking. 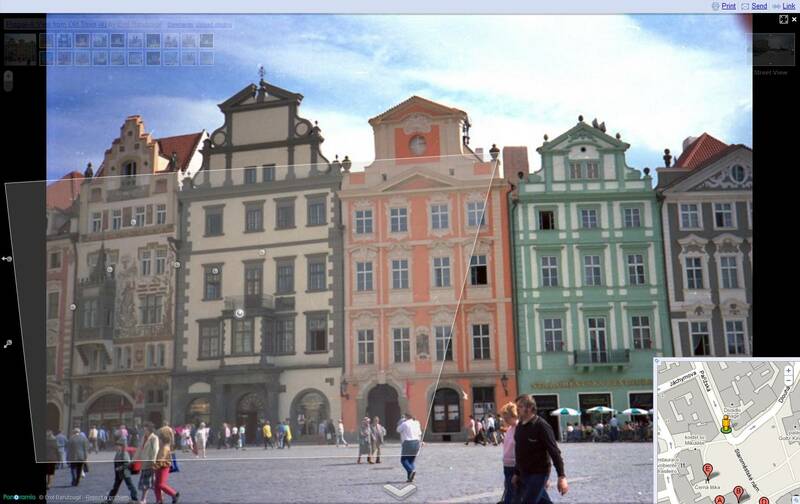 Contrast can be seen for example by comparing the imagery of the Historic Centre of Warsaw, a UNESCO World Heritage site, described as an 'outstanding example of a near-total reconstruction of a span of history covering the 13th to the 20th century'. 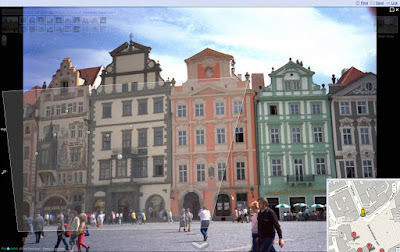 The Royal Castle was completely burned to the ground, for example, and subsequently reconstructed, between 1971-1988. Read more about one Googler's impressions here. To access all the imagery for yourself, and compare to the present day cityscape, click the clock icon in the top-level toolbar to activate a time-line in the Google Earth display. Move back in forth in time by dragging the time slider from left to right or by clicking the back/forwards arrows. Many of us have heard stories, read books and watched films which show the many impacts of WWII across the world. Today we're giving you another way to understand this period in time - by exploring a new set of historical aerial images, taken over European cities during World War II, via the historical imagery feature in Google Earth. They can now be compared directly to images from the present day. The historical imagery feature gives people a unique perspective on the events of the past using today's latest mapping technology. We hope that this World War II imagery will enable all of us to understand our shared history in a new way and to learn more about the impact of the war on the development of our cities. Images taken in 1943 show the effect of wartime bombing on more than 35 European towns and cities. Imagery for Warsaw, which was heavily destroyed at the time, is available from both years 1935 and 1945. They remind us all of the devastating impact of war on the people in those cities and also the remarkable way in which urban environments are reconstructed and regenerated over time. You can explore the German city of Stuttgart, which was subject to over 50 air raids during the War. fondly recalled the Polish-American community of her childhood in Yonkers, N.Y., she told stories of traveling to Poland with my uncle, she read out loud the letters she received from our family there, and during Christmas she led aunts, uncles, and cousins in sharing a wafer called opłatek, which prompted hugs and kisses around the table. These are all good memories. 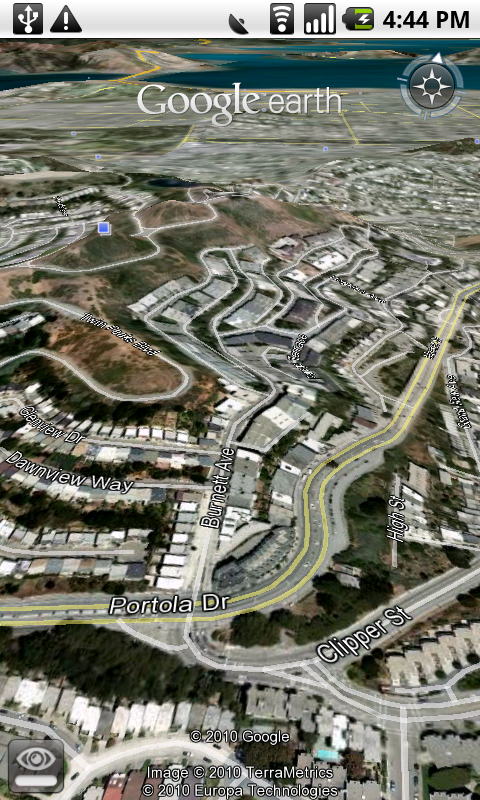 Like many, I have often used Google Earth to explore the world around me. When it comes to Warsaw, Poland, imagery now available from 1935 and 1945 reveals an opportunity to better understand the history of a city destroyed and rebuilt. I studied the global devastations of World War II in school and read books about history, but the atrocities that took place during the 1930s and '40s bore little resemblance to much of the country I saw when I first visited in 2005. Poland had recently joined the European Union and brimmed with an overarching energy and enthusiasm toward the future, amidst reminders of a history that could not be forgotten. During three weeks spent traveling from Wrocław to Zamość and many places in between, I found myself mired in the contrasts between present and past: mesmerized by the beauty of Kraków, speechless with sorrow at Auschwitz. In Warsaw, I stayed with cousins, ate plate after plate of pierogi and naleśniki, and explored the parks, squares, markets, and side streets that wove throughout the city. The realities of what had taken place only decades prior struck me powerfully at the Warsaw Rising Museum, which commemorates the resistance of the Polish Home Army. I left horrified and humbled. Four years later, here at Google I met with a representative working on the multimedia efforts of the Museum of the History of Polish Jews, set to open in 2012 on the site of the former Warsaw Ghetto. More than anything, we spoke about the fundamental importance of memory and the power of technology for sharing with a community around the world. The following images are from 1935, 1945, and the present day. Click to enlarge. The largest ghetto in all of Europe, the Warsaw Ghetto was the site of the deportations and murders of hundreds of thousands of Jewish people between 1940 and 1943, as well as the location of the Warsaw Ghetto Uprising. Founded in 1816, the University of Warsaw is Poland's largest university and the academic centerpiece of the city. Between 1939 and 1944, the university lost a majority of its buildings and collections, and many of its students and professors lost their lives. As we view these aerial scenes in Google Earth using the historical imagery time slider, we see the history of Warsaw against a much different landscape today. I think of how many grandparents, like my babcia, have shared stories of their childhoods and families, including memories both good and bad. Images like these help unlock and preserve the past even as we look to the present and the future. 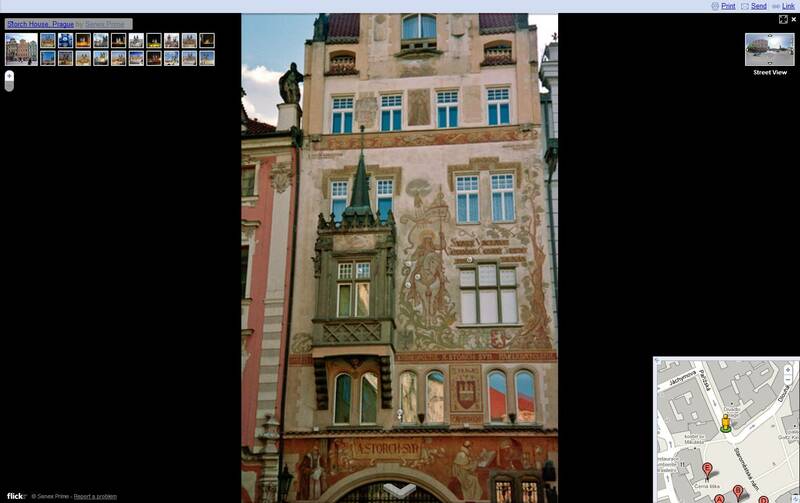 When I think about Poland, I think about my grandma. Babcia fondly recalled the Polish-American community of her childhood in Yonkers, N.Y., she told stories of traveling to Poland with my uncle, she read out loud the letters she received from our family there, and during Christmas she led aunts, uncles, and cousins in sharing a wafer called opłatek, which prompted hugs and kisses around the table. These are all good memories. buff, we've got an update that you'll be excited about (and if you're not, I hope you will be one by the end of this post). Most of the underwater terrain currently featured in Google Earth comes from the low-resolution US Navy/NOAA/SIO global grid. They're able to predict what the seafloor looks like using an extrapolation of water surface heights to estimate undersea mountains and canyons, based on radar data collected by satellite (if you're curious about this process, you can read Smith and Sandwell's more detailed explanation here). For most of the sea, that's all that's available. But a small part of the ocean has higher-resolution data available, based on echosounding sonar from ships, and it's now available in Google Earth. The California State University at Monterey Bay has collected high-resolution underwater terrain data for the entire California coast out to three nautical miles. We've published their data north and south of San Francisco Bay down to Ano Nuevo, where you can see the underwater ridges that elephant seals must navigate. You can now also explore large undersea areas newly published from the Monterey Bay Aquarium Research Institute (MBARI), including our highest resolution underwater depth data featured to date: 1-meter terrain collected by MBARI’s Autonomous Underwater mapping Vehicles in Monterey Bay Canyon (see screenshot below), which is an underwater canyon larger than the Grand Canyon nestled between Santa Cruz and Monterey, California. MBARI has also shared ship echosounding maps that they've collected on the Davidson seamount, the Rodriguez seamount off of Santa Barbara, and terrain along the Juan de Fuca Ridge, as well as data collected off of the Oregon coast, from Beaver basin to the Heceta bank. Photo caption: The MBARI Autonomous Underwater Vehicle (AUV) being launched from the Research Vessel Zephyr and one underwater. The MBARI Mapping AUV is a torpedo-shaped vehicle equipped with four mapping sonars that operate simultaneously during a mission. The sonars are a swath multibeam sonar, two frequencies of sidescan sonars, and a sub-bottom profiler. The multibeam sonar produces high-resolution bathymetry (analogous to topography on land), the sidescan sonars produce imagery based on the intensity of the sound energy's reflections, and the subbottom profiler penetrates sediments on the seafloor, allowing the detection of sediment layers, faults, and depth to the basement rock. All components are rated to 6000 m depth. The vehicle is launched on programmed missions and runs on its own battery power until it returns to the ship, as programmed, for recovery. The mapping AUV was christened the D. Allan B. in honor of MBARI's long-time Board member Dr. D. Allan Bromley of Yale University, who passed away in 2004. Download this new undersea tour and open it in Google Earth to explore for yourself. Remember that only 5% of the world’s oceans have been explored, so much remains to be discovered. We continue to publish new data in Google Earth, so check back. We thank all of the ocean exploring groups who have shared their data and welcome new contributions. If you happen to be a bathymetry buff, we've got an update that you'll be excited about (and if you're not, I hope you will be one by the end of this post). Most of the underwater terrain currently featured in Google Earth comes from the low-resolution US Navy/NOAA/SIO global grid. They're able to predict what the seafloor looks like using an extrapolation of water surface heights to estimate undersea mountains and canyons, based on radar data collected by satellite (if you're curious about this process, you can read Smith and Sandwell's more detailed explanation here). For most of the sea, that's all that's available. But a small part of the ocean has higher-resolution data available, based on echosounding sonar from ships, and it's now available in Google Earth.